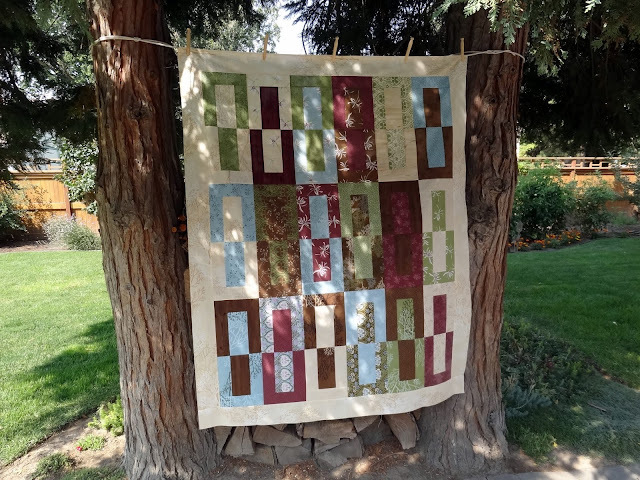 Squash House Quilts: Long Johns on the Line! Recently I had the pleasure of another Supreme Testing Job for Stephanie at Loft Creations. When she told me the name of the quilt, Long Johns, I raised an eyebrow! Once I saw the directions, though, it couldn't have been clearer! Check it out! The pattern uses a layer cake and is very clever, if you ask me! I wanted to make it a little larger, so with Stephanie's blessing, I added a border. I used a layer cake of Twiggy by Sanae for Moda that I've had for quite a few years. I also happened to have some yardage of this fabric for the border, backing and binding. I really like how it turned out! Do any of you have childhood memories of a family member's long johns hanging on the line? I sure do! I guess that makes me a "woman of a certain age" but Mr. Squash tells me I am quite well preserved (wink)! Here is is a little closer. If was a fun and easy quilt to make and went together very quickly. You can purchase the PDF for the pattern right now HERE. Unfortunately I haven't been able to quilt it just yet. Gracie May likes to jump up on my longarm table, so I've been hesitant to start anything until she gets a bit older. I've been busy in the kitchen as well. I've gathered a lot of wonderful recipes from some of my favorite food blogs, lately. This one is Pear Gingerbread Crumb Cake from Sue at The View From Great Island. I can't tell you how many of her recipes I've made and they always turn out great! I also made another of Sue's recipes - House Made Green Tabasco Sauce. Now that I see the photo I probably should have shaken it up a bit. My jalapeno crop this year is phenomenal, so I thought this would make good use of it! We just love green Tabasco sauce! I'll order a pizza just so I can use the sauce! It wasn't difficult to make, either, and Sue's instructions are very good! 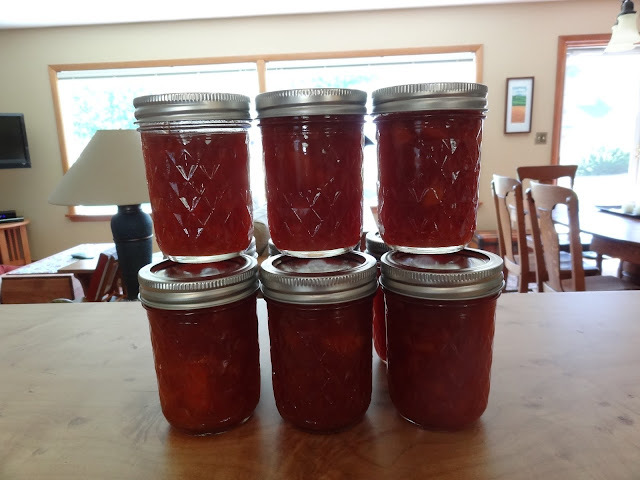 Yesterday I made Spiced Peach Preserves from my friend Karen at Short Story Long. Wow - is it ever wonderful! There was a little left that was too small for a whole jar. Mr. Squash and I made short work of it! I just love this time of year when there is so much fresh fruit and vegetables to make magic with! Speaking of Gracie May, we picked her up this morning from an overnighter at the vet. She was spayed yesterday but you'd never know it. She seems as happy and rambunctious as ever! Now the tough part will be keeping her semi-quiet for the next 2 weeks! I think we need a lot of luck for that!! Love your Long Johns, especially on the line. :o) Thank you!!! Your food stuff looks so yummy but I love peach anything. :o) Gracie May will keep you and the mister hopping for sure. Love that quilt, and esp. the name cuz I remember long johns. I grew up on a farm and in the winter, you needed them over here. I'm coming over for that cake - be still my heart it looks so good and that jam sounds so delicious too. Glad Gracie Mae is home and doing well. Hugs!! I thought we were about to see some of Mr. Squash's under garments...THEN I thought it was a bit warm for longjohns. Thank goodness it was just another wonderful quilt from you and Stephanie. The cake looks divine as does the peach preserves. We love Tabasco sauces of all kinds so I know what you mean about ordering a pizza just to use the green one. Thanks for sharing those links...I am really in the mood to do some baking. Of course I'll have to turn the a\c down really low. Please give Gracie Mae a special pet from me. Amazing how quickly the young ones bounce back. I'm with you on the jalapeño sauce. We eat it on pizzas and also on cheese sandwiches. How great you could make your own. I never even thought to do so, but then our clima is not really jalapeño friendly either. Two of my recipes --- I'm so flattered! 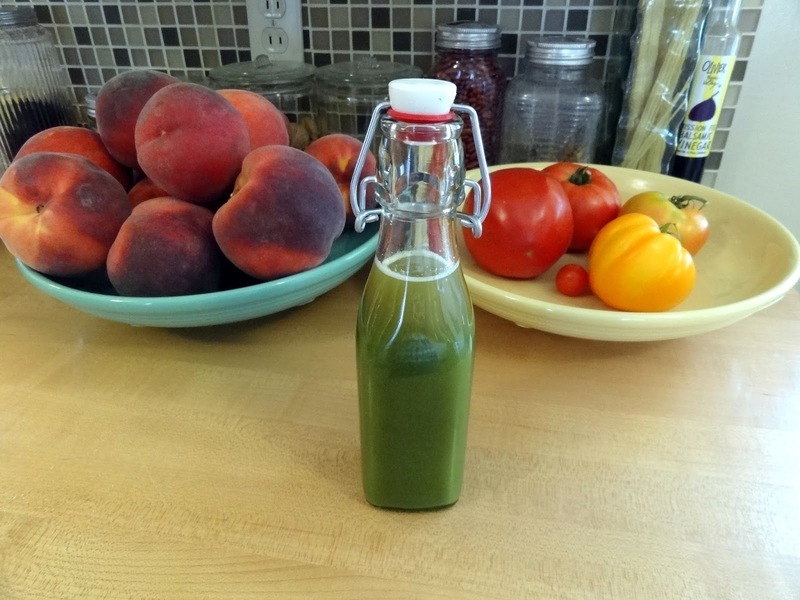 I'm really enjoying my green Tabasco, I'm making eggs for dinner just so I can use more of it! 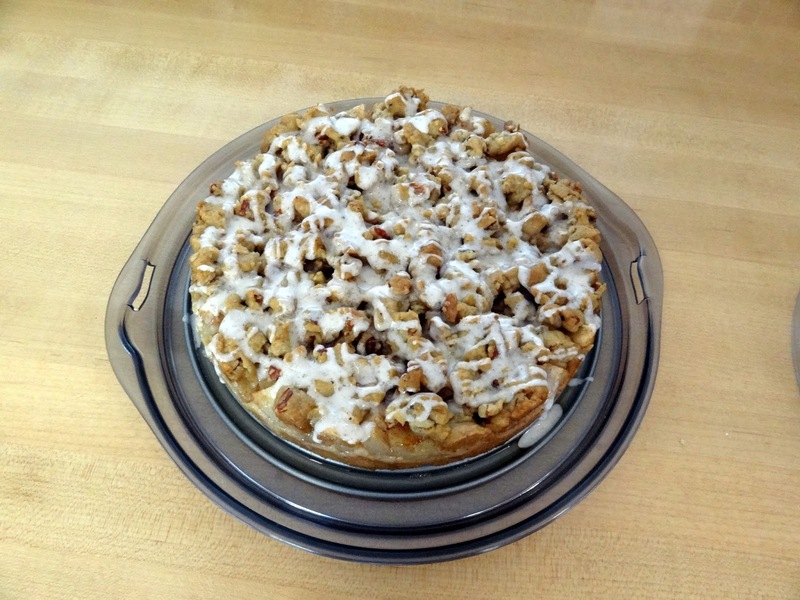 Your photos of your cooking and baking are enticing! I'm off to buy some pears this afternoon. That is a great quilt and I love the name of it. It is so nice to be able to preserve some of the garden for the winter. You have been busy with your food recipes. The cake looks so good. And look at your version of Stephanie's new pattern. Love it!!! What a cute name for this wonderful quilt ! I am going to go and check out Sue's recipes ! The pear cake looks yummy ! Your Long Johns is great! Long Johns certainly have changed since my grandpa's day. I like yours better. 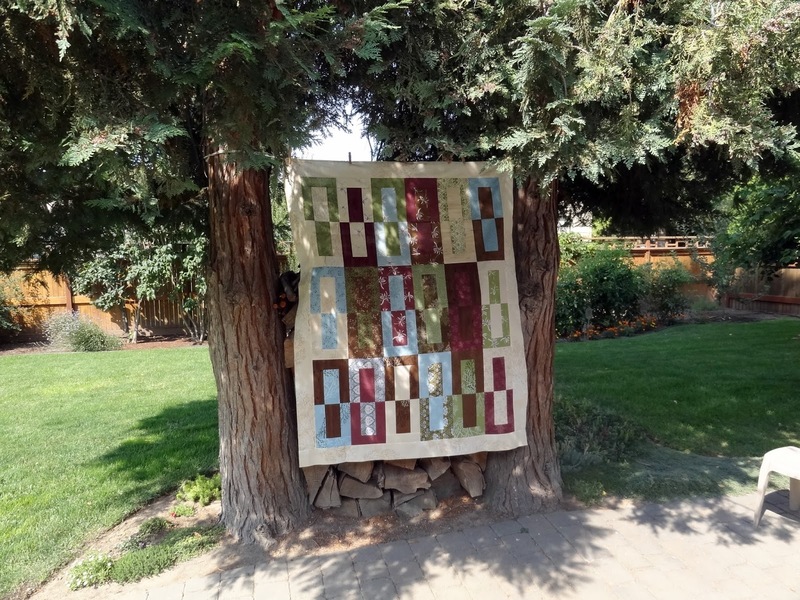 Love your Long Johns quilt...gorgeous fabrics! I love your quilt! As always Stephanie's patterns are terrific and your version of it really does it justice. Your version of Long Johns is beautiful! I have last winter's memories of long johns, no, this summer too, because Mr. K wears thermal long johns under his waders when fishing. They belong to our normal life for at least 6 months of the year, and with still two men in the family I've had my fair share of washing and hanging them on the line. - Your cooking looks delicious, and you certainly made magic with your vegetables and fruit. I'm glad you liked the Spiced Peaches. I'll have to try the green tabasco, we've got jalapenos this year, too! Oh, love the quilt, too!! Another wonderful pattern from Stephanie! Your version reminds me of cinnamon scents and autumn leaves! Beautiful brown shades! My mouth is watering looking at your dessert and preserves! Glad you are enjoying your fruits of labour from the garden. Great to know Gracie May is doing well after her visit to the vet. It can be tough to keep a naughty kitty quiet! Hi! Love your Long Johns, especially with the border added; can I ask what size you made the border? I actually went and bought the pdf as I've a layer cake waiting for a quick and simple pattern that would work up to a sofa size! Thanking you! Love the Quilt - I have a funny Long John story. I used to work with an older lady and she liked to drink alot on her days off. One night in July (when she had quite a bit to drink) she got up during the night to go to the bathroom, and in the morning... she realized she had "peed" in her husbands long john drawer, and she had to wash everything and the neighbours asked her why she was washing long johns in July. Ha Ha.. true story. No long johns on the line memories here, Candice, but I love the quilt pattern! Another great idea out of Stephanie's brain! Your dessert looks scrumptious and the rows of canned specialties too. Glad your newest member can no longer be able to make newer members :) Kittens are pretty irrepressible, for sure.